(Nanowerk News) Engineers at the University of California, San Diego developed a new technology that uses an oscillating electric field to easily and quickly isolate drug-delivery nanoparticles from blood. The technology could serve as a general tool to separate and recover nanoparticles from other complex fluids for medical, environmental, and industrial applications. "This is the first example of isolating a wide range of nanoparticles out of plasma with a minimum amount of manipulation," said Stuart Ibsen, a postdoctoral fellow in the Department of NanoEngineering at UC San Diego and first author of the study published October in the journal Small ("Recovery of Drug Delivery Nanoparticles from Human Plasma Using an Electrokinetic Platform Technology"). "We've designed a very versatile technique that can be used to recover nanoparticles in a lot of different processes." This new nanoparticle separation technology will enable researchers -- particularly those who design and study drug-delivery nanoparticles for disease therapies -- to better monitor what happens to nanoparticles circulating in a patient's bloodstream. One of the questions that researchers face is how blood proteins bind to the surfaces of drug-delivery nanoparticles and make them less effective. Researchers could also use this technology in the clinic to determine if the blood chemistry of a particular patient is compatible with the surfaces of certain drug-delivery nanoparticles. "We were interested in a fast and easy way to take these nanoparticles out of plasma so we could find out what's going on at their surfaces and redesign them to work more effectively in blood," said Michael Heller, a nanoengineering professor at the UC San Diego Jacobs School of Engineering and senior author of the study. The breakthrough in the technology relies on designing a chip that can work in the high salt concentration of blood plasma. The chip's ability to pull the nanoparticles out of plasma is based on differences in the material properties between the nanoparticles and plasma components. 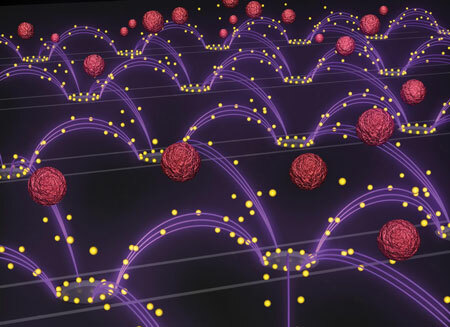 When the chip's electrodes apply an oscillating electric field, the positive and negative charges inside the nanoparticles reorient themselves at a different speed than the charges in the surrounding plasma. This momentary imbalance in the charges creates an attractive force between the nanoparticles and the electrodes. As the electric field oscillates, the nanoparticles are continually pulled towards the electrodes, leaving the rest of the plasma behind. Also, the electric field is designed to oscillate at just the right frequency: 15,000 times per second. "It's amazing that this method works without any modifications to the plasma samples or to the nanoparticles," said Ibsen.